I don’t know how to write about a trauma that is not mine, yet invisibly and with utmost uncertainty, I have inherited its wounds. I don’t know how to write about a wound that I cannot see, a wound that I don’t remember receiving, a wound that is often forgotten but somehow felt. I am thinking about how, as Korean-American writers, there seems to be an invisible thread that somehow tethers us along a common trajectory, common ghosts and conjurations. at we can understand implicitly a combination of real and felt trauma and suffering, perceived trauma and suffering, and also an invisible trauma and suffering, a trauma that is not ours, a trauma that is not mine, yet somehow corrupts ours thoughts and feelings and actions daily. 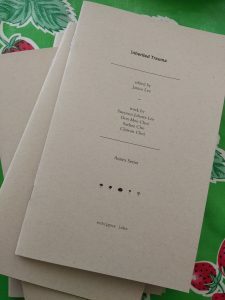 Edited by Janice Lee, Inherited Trauma is the 2nd eohippus labs Annex Series pamphlet anthology. Inherited Trauma includes So say it by Sueyeun Juliette Lee, Wings of Return: Ahn Hak-sŏp #1 by Don Mee Choi, JESA – A MAP, A HISTORY, A SPREAD OF SOMETHING I DON’T KNOW. HERE IS A SLICE. by Saehee Cho, Ghost/River/Tree by Chiwan Choi, and an introduction by Janice Lee.